I can’t remember a time I’ve been asked more repeatedly and persistently for an update on anything as I have been about Lazaruff. He’s the dog Teresa and I met while I was volunteering at the opening of a new clinic attached to the St. Landry Parish animal shelter in Louisiana, at an event spearheaded by American Humane. Lazaruff had been found abandoned in an empty house, emaciated and covered with flies. The people who found him thought he was dead, but when animal control arrived, they saw he was still alive and rushed him to the vet. There, they found this dog who should weigh 55 pounds weighed 19 pounds. After hydration, that came up a bit, which is where he was when we met him. Teresa and I had sworn we wouldn’t adopt any of the dogs we saw at the clinic, but one look at Lazaruff (then called Relic) threw that promise out the window for both of us. But the story was still far from simple. First, he was not just too ill to travel, but far too ill for anyone to know he could be saved. But his wagging tail and affectionate nature made everyone who met him determined to try. 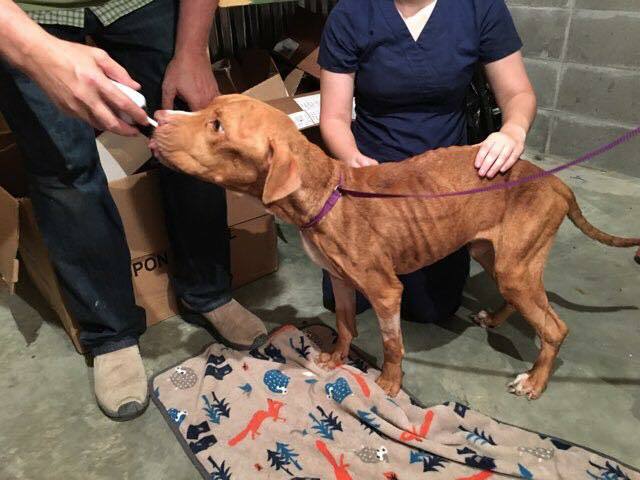 We moved him to Bellevue Animal Clinic in Opelousas, Louisiana, and the care of Dr. Kevin Fuselier, where we began the long, slow process of getting some weight on him. We consulted with boarded nutritionists, hand-fed him, and weighed him daily. Slowly — much too slowly — be began to gain weight, although there were constant setbacks. He had other health issues that couldn’t be addressed until his overall condition improved, including treating his heartworm infection. But life in the kennels at the vet hospital began to cause him a great deal of stress, so we looked for a foster home. He briefly went to one, but it was a case of too much too soon, however, as he overloaded immediately. He also let us know he did not want to be in a house — it was probably a new experience for a dog who had most likely always lived outdoors. So back he came to the clinic. To help with his stress, we consulted with boarded veterinary behaviorists associated with Fear Free, and implemented enrichment into his daily routine and kept feeding him. We just got the incredible news that he’s now at 53 pounds, just two pounds short of a weight healthy enough to commence heartworm treatment! We’ve also resumed the look for a foster home, this time one without other pets. We’re still looking, but one thing we know: the home needs to be very close to Opelousas (in the Lafayette, Louisiana, area), so Dr. Fuselier can continue his care. 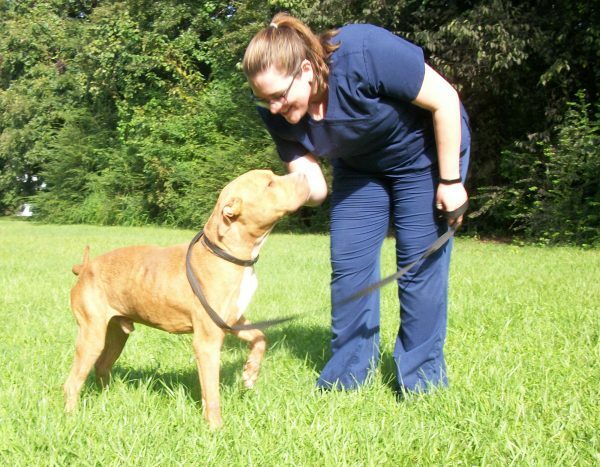 This experience has also opened up the question of whether or not Lazaruff can live with other dogs. It’s a question we can’t answer yet. If he can’t, we’ll be looking for the best, most loving home where he can be an only dog, and he’ll always be a member of our extended family. If he can, we’ll get him out to us here in Idaho the minute Dr. Fuselier gives him the green light to travel! Even if he can’t adjust to living indoors, our sweet Quill’N also insists on being an outdoor dog (although she has started tentatively coming indoors from time to time), and he could live with her if they got along. This has been a long, frightening, and humbling road, but please know that the Becker Family is continuing to pray for Lazaruff and pay for his veterinary care. We will never abandon him like his first family did! And if you have a possible only-dog home to offer him, either near Lafayette, Louisiana, as a foster home, or anywhere else as a forever home after he’s well enough to travel, please contact us at petconnectionfbt@gmail.com. And please, hold him in your prayers and thoughts! He is much, much better but not yet out of the woods.